Pungluang Sor Singyu dominates in a title clash against the Filipino challenger Jetro Pabustan Today February 12, 2016 at Nakhon Ratchasima, Thailand. The fight was stopped in the 7th round after Punluang Sor Singyu's left eye excessively bleeding due to an accidental headbutt. Sor Singyu won the fight with all judges decisions 70-63 identically. Pabustan who fought for the world title for the first time is coming off 4 consecutive victories and Sor Singyu won the vacant WBO World bantamweight title in his last fight against Ryo Akaho of Japan last year. 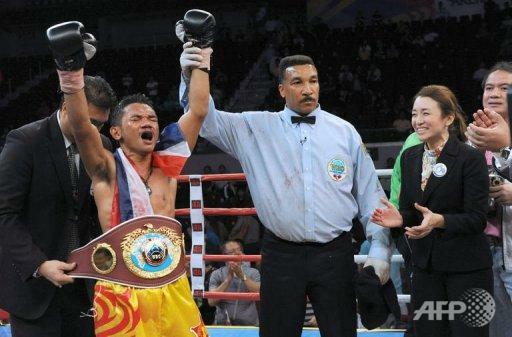 Sor Singyu successfully won his first title defense and improved his record to 52W(35KO)-3L while the Filipino boxer Pabustan falls to 26W(7KO)-3L-6D.